← Craig Mather Shows He Can Talk As Much Rubbish For #Rangers As Messrs Green and Whyte! 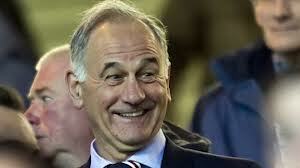 The Board of Rangers is pleased to announce that it has today appointed Charles Green as a consultant to the Company. Mr Green’s role will be to promote the interests of Rangers Football Club, specifically assisting with shareholder relations and advising the Company on its capital structure. What a fine choice! Well done Mr Green! After all it must be a good thing for RIFC to employ someone whose job is to “promote the interests of Rangers Football Club” although one might wonder if that was not being done already. Who better to help advise on “capital structure” than a man with 7% of the share capital! And who better to be incentivised to boost the slumping share price than a man who bought millions of shares for 1p and who, according to one prominent Rangers source, is looking to sell for £1 per share. As the share price is 41.5p just now, it will surely be helpful to have the influence of the “Businessman of the Year” to get it back to the flotation price, or the post float heights of in excess of 90p. As he is also there to assist with “shareholder relations” then we can expect to hear him making many more of his public pronouncements, and so it is likely that I will have lots to write about! Charlie there’s creditors need paying, with your big ‘ands! Haha! Here we go,here we go,here we go …….. Cannae wait. Thought i’d cheer you up Monti with an old song from Max Bygone ! A shareholder group is looking to oust Craig Mather, according to STV. Who is the shareholders relation he will be assisting ? Ahmads mum by any chance ? Great news for Paul and the rest of us,,,life is an entertainment business and if i was gonna be stuck in a lift with either The Coyote or Huge Hands then i know who i would pick. Gaun Charlie give them laldy,,,get the Orange taps out! Wouldn’t have said Huns were familiar with the word ‘taps’? Is Taps not what the Americans call the Last Post, you know the bugle thing that gets played when something has passed away ? “Hours after the appointment of former chief executive Charles Green as a paid consultant, a further statement to the London Stock Exchange revealed that a group of shareholders – including former Ibrox director Paul Murray – had launched an official bid to join the board “. They also called for the removal of chief executive Craig Mather. They deserve everything they get . I also thing Mr G’s holiday allowed Mr S, Chairman to sell season tickets, when that was done, move over Mr S, i’m back. You go work out Mr McC’s problem which is to de-man 40% of that overinflated squad he’s assembled, or/sack some of his backroom team. I’m not paying for people who don’t produce. Look forward to a 6 month pumping of the shares followed by an end of restrictions fire sale! Or maybe a second share issue? Could he be that bold? DIN DIN DIN!,,,The Spanish Inquisition,,,,Paul Murray?,,the Blue Knight?,,,Frank Blin?,,,Frank Drebin? @cam – you’re getting there. Lol. Told them here there’d be a new ‘owner’ by Christmas. It’s all starting to come together. A racist consultant. How very apt! Do Sevco really need any help in that department? Now is not the time to rush to judgement. I think we should just see how this pans out! Love the post Mick, Charlie and his crew are under investigation of that you can be sure. I’ts tho 5088 bit i can’t get out of my head, every time i see the big white van driving around with the blue numbers 3666 thing on the side i think of ‘sevco’ bothers me it does. Another clown enters the big top…. We all knew Green has been behind the sham of boardroom changes, one puttetmaster DM replaced by another, Chucky was never gonna let someone else influence his payday. Green is just a useful idiot for Ahmad. Chuckles can see his winnings being frittered away by Super Ally and the rest of the clowns before he can cash in, so he comes scurrying back to plug the leaks and drum up some cash from the most gullible fools on the planet. Meanwhile the SFA just stand around wringing their aprons. First thing Green must do is find that Dallas Cowboys email! Word on the street is that he could hear the Champions league music playing out of Glasgow the other night and he thought it was for the Ramsdens cup so he hurried back with his big hands and bigger pockets! What’s all this eek-eek stuff? A move akin to asking a surgeon to sew a bunch of piles back on to an aching arse. Bizarre, painful if you own the arse, but amusing to watch the suffering if you don’t much care for the owner. Welcome back Chuckles. ‘Appen t’carpet bag must ‘ave been gettin’ a bit light. Clap hands here comes Charlie, no season tickets being sold, fans pissed off, Charlie gets out of Dodge, Walter takes the lead, Zombies head back in there droves buying up season tickets, 37,000 sold, enter Charlie Bhoy, HEY that’s my dosh, I am back in charge, Wattie, shut it, you know nothing about business that’s why I gave you the job, RIGHT! Where where we when I left ……oh right, the naming of the stadium…………. Don’t know about Dallas Cowboys but Chuckles coming back to T’RFC is like Bobby Ewing’s shower scene in Dallas. Just when you thought it was safe to invest……don’t go near the Cashline….IT’S BAWS!!!!!!!!! MUTTON BAWS! Mr M sat on that same board and said nothing of what he knew that was goingwhen Mr W was in control,he proved what he was, he ain’t no better than any of the others, he’s tainted, tarnished and will ultimately suffer some consequence in the final outcome. Expect much more from charlotte now that chico is back ! Aye bud, like leaking an email from Frank Blin requesting match tickets for a terminally ill child ? Well done Charlotte. and Whyte. Two baws in the same bag.